I am not a big fan of cooking shows usually, I find them a bit tedious at times and often they cook things I don’t care to eat. That said I am fan of Top Chef on Bravo, not really for the competition aspect of it, but the inventiveness of many of the chefs on the show. The other night while working I had it on TV and heard one of the judges say that they were impressed by a brussels sprout slaw that had raw brussels sprouts in it. I sat there at first very confused because I myself had never really like the taste of raw brussels sprouts and didn’t understand how it could be good, but I figured I would try my own version by modifying a slaw recipe I had once read replacing cabbage with the brussels sprout. The slaw is pretty simple: take all the ingredients and mix them up in a bowl. The cayenne I think is key here and is a really nice addition adding a subtle spiciness to the whole thing, but don’t add too much. Its the easiest thing to do for the meal so do it first and set it aside. I let mine sit in a bowl for about an hour or two before serving so that the flavors really mixed. You could make it right before or even earlier. 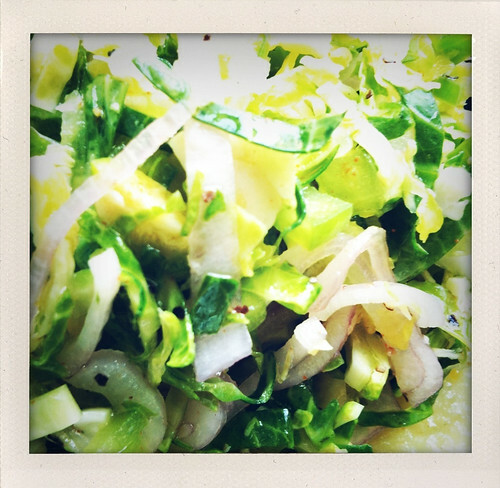 I know at some point you are asking yourself about the flavor of raw brussels sprout but try it before you bag on this recipe. 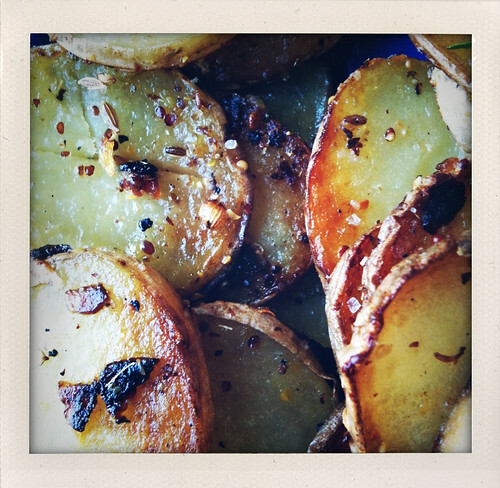 The potatoes are also simple and easy, but they take the longest to cook. Heat up a skillet to medium heat (or slightly above). Heat up the olive oil in the pan, toss in the garlic let it cook for a few minutes not too long though, add the potatoes and cook them until tender. About 20-30 minutes. Season it to your liking before you finish cooking them. I used some kosher salt, course ground black pepper, and some gourmet grinder blend. 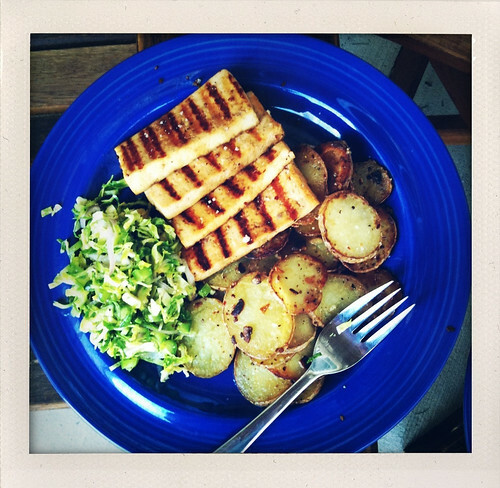 Prep the tofu as I did here in this post. Try to remove as much of the moisture from it as possible. In a bowl mix together the maple syrup, bourbon, mustard, smoked pepper, and molasses. After preparing the tofu soak the tofu in the marinade for 15-30 minutes. Make sure that the some of the mustard seed stick to the tofu as well. Heat up a grill pan to medium heat on the stove (I guess you can use a real grill if you want to but I was being a little lazy). Toss the tofu on there grill, grill each side until the tofu is cooked through and the grill pan has left some really nice grill marks on the tofu. Its somewhere around 6 minutes each side. Salt and pepper the tofu as it cooks right before you take it off. I used a Chardonnay Oak Smoked Sea Salt for the salt and a little bit of coarse ground black pepper. Put it all on a plate and enjoy. Holy YUM! We wanna come over! This looks great – I’m excited to make it! Just wondering how much tofu comes in your packages? 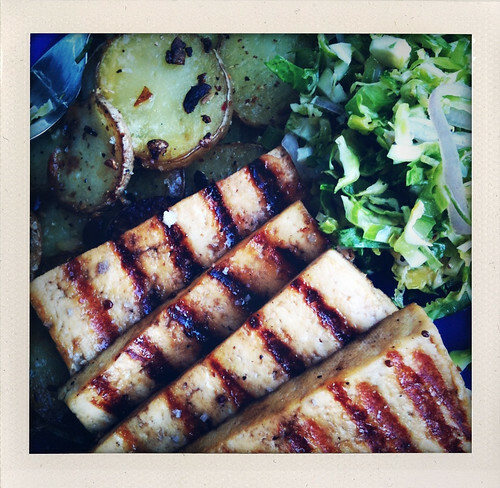 I don’t want to get the proportions of tofu and marinade way off. Tofu was in a 16oz package. Enjoy!